Hunting down alien planets isn't just for professional astronomers anymore. 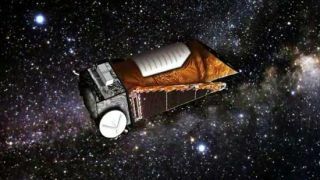 Thousands of citizen scientists have been poring over data from NASA's Kepler spacecraft, which has so far detected 1,235 potential alien worlds. To date, the amateurs have flagged 50 candidate planets that the mission's sophisticated software may have missed, Time magazine reports. It's all part of a project called Planethunters.org, which enlists the discerning eyes of the masses to pick up patterns in mountains of data. "It really is the wisdom of the crowd," said lead project scientist Meg Schwamb of Yale, according to Time. The $600 million Kepler space telescope, which launched in March 2009, finds alien planets by searching for tiny, telltale dips in a star's brightness caused when a planet transits — or crosses in front of — it from Earth's perspective. Before Kepler came along, astronomers had discovered about 500 planets circling faraway stars. Kepler has already added 1,235 "candidates" to this list, which must be confirmed by follow-up observations. Researchers have estimated that at least 80 percent of these worlds will turn out to be the real deal. Kepler is staring continuously at a patch of sky containing about 150,000 stars, looking for the tiny dips of light that might indicate a transiting alien planet. It finds these little blips by using sophisticated sifting software. But some planets could potentially slip through the cracks — and that's where the citizen scientists come in. The human eye is great at recognizing patterns, Time reports, and Planethunters.org takes advantage of that quality. Visitors to the website require minimal training — just a simple explanation of what they're supposed to look for (generally, a series of regular dips in a star's brightness over time). Then they can start scrolling through reams of Kepler data, with the chance to find a previously undetected alien planet. And that does happen. In the few months that Planethunters.org has been operating, about 22,000 visitors to the site have found nearly 50 potential planets, according to Time. These new candidates are sent to Kepler headquarters, at NASA's Ames Research Center in Moffett Field, Calif., for follow-up investigations. The idea behind Planethunters.org is similar to that of the Galaxy Zoo project, which enlists amateur aid to help catalog and characterize a million galaxies by their shape. Kepler scientists are more than happy for the help the amateurs are providing — and they're not shocked by their very real contributions, Time reports. "It's absolutely no surprise to me that they'd find planet candidates we missed," Kepler deputy principal investigator Natalie Batalha said. It can be tough for the Kepler software to distinguish stars that pulsate naturally from those that dim because of planet transits, she added. "Our software does a good job of weeding out these stars, but it's not perfect." Planethunters.org isn't just benefiting the Kepler mission, Time reports. It's instilling a sense of wonder and excitement that can hook people on math and science — perhaps helping to inspire many future planet-hunters of the professional variety. "You've got kids doing this, experiencing the thrill of seeing something for the first time that nobody else has ever seen," Batalha said. "It's just fabulous."